As part of the Legends of Frontierland event currently going on at Disneyland, there are some very fun things happening in the wild wild west. I was recently passing by when I was stopped by L.B. himself. He’s got his elixir stand set up and he’s ready to help you solve your life problems! With lots of personality, L.B. told me all about his product. I’m not going to spoil any of the fun interaction or stories for you, instead I’ll just tell you that there are three elixirs to choose from. He was such a good salesmen that I had to try all three! Ready to enhance your life???? Bottoms up! I asked L.B. if I drank them all in a row would I get all three things and he said, “Of course!” So down the hatch they went. I started with Knowledge. Described as Tea infused with Lime, Passion Fruit, Vanilla and a zap of Pureed Ginger for smarts, this one was actually quite tasty. Up next, I was ready to get lucky! 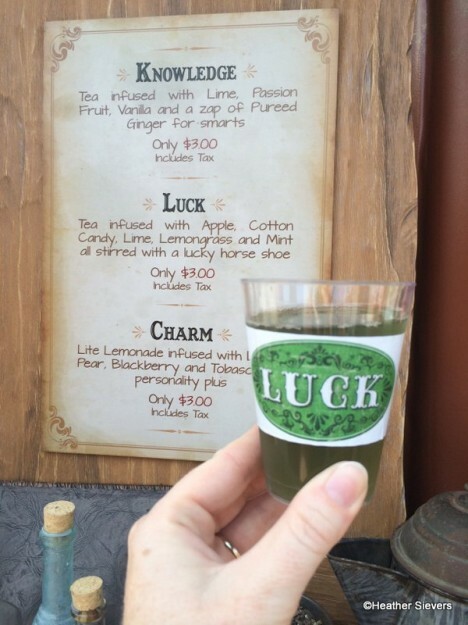 The green Luck elixir is Tea infused with Apple, Cotton Candy, Lime, Lemongrass and Mint all stirred with a lucky horse shoe! I mean come on, I’m totally going to win the lottery now, right? This drink was my favorite of the three. Very sweet, but really fun flavors. Last up was Charm. Thank goodness I’m already married, because this one was yucky! Lite Lemonade infused with Desert Pear, Blackberry, and Tabasco for personality plus! The spice was definitely too overpowering for me, but I am a light weight when it comes to spice. So maybe you’ll enjoy it! L.B. Enterprises is so much fun!!! I’m now obviously a tiny bit more charming, way smarter and SO SO lucky! L.B. is a great character and my guess is that he’d be able to sell anything to anyone! 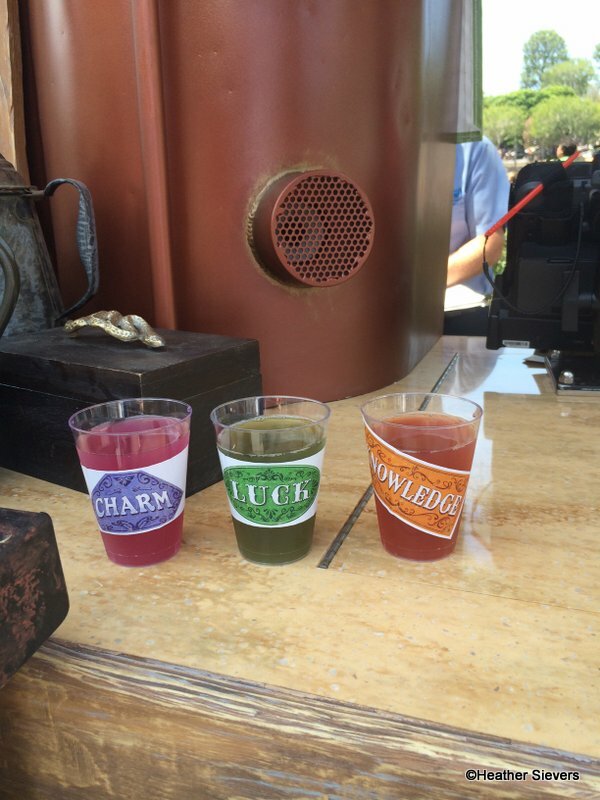 Also, please note that the flavors of all three elixirs are very strong. The small portioning is perfect and really all you need. At $3 a pop for each serving it is a bit pricey, but it’s really more about the interactive experience. L.B. 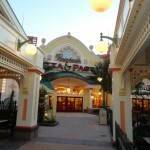 will be in town as long as the Legends of Frontierland event is going on. As of now, there is no end date published, so head on over and visit before he’s gotta pack up and get outta town! 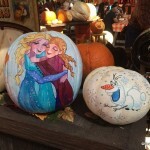 Have you been over to Frontierland to participate in Legends of Frontierland? Have you visited L.B. yet? If so, are you feeling smarter, luckier or more charming???? 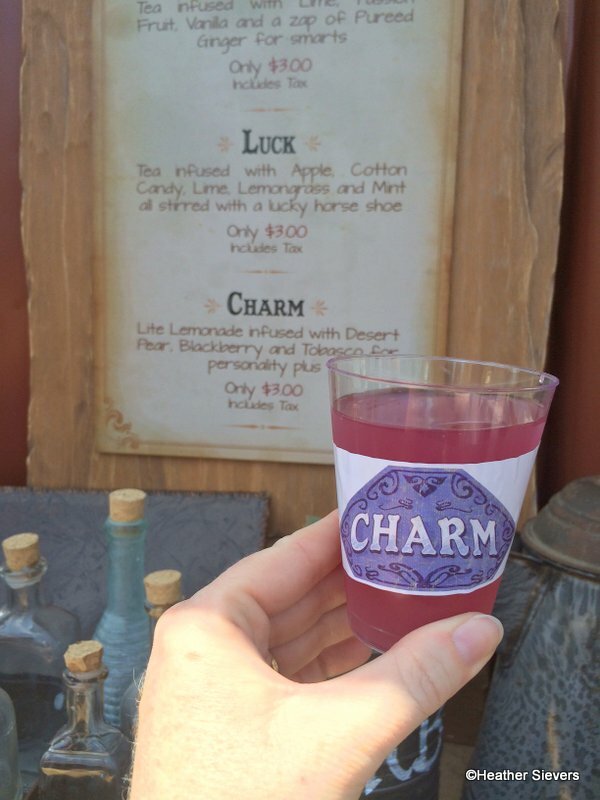 As I understand it, you should sip your elixir slowly and carry it with you on your travels throughout Frontierland. Make sure cast members and other players see your elixir – it’s all part of the game and should help your progress. 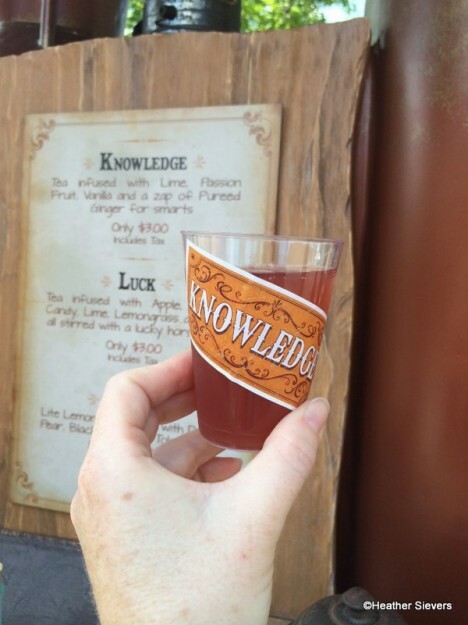 Seems a touch like they’re riffin’ on the Elixers of Diagon Alley some…..dunno if that was intentional or not. 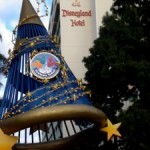 I’d certainly be watching WDW to see if any sort of stand like this shows up in Fantasyland. I agree that for $3.00 those glasses look pretty small, but the first two flavor mixes sound really tasty and the idea behind the stories sounds like a lot of fun. 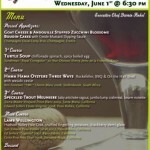 @NancyS – Ahhh! Ok, that makes sense. We weren’t playing, just observing! 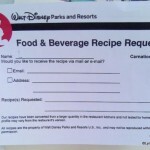 @Chris – I don’t think so, only because it’s part of the Legends of Frontierland activities going on right now. It’s definitely temporary. Just not sure for how long. @Essie – It was really fun! Not something I’d get more than once though. I would never want a drink with tobasco in it-nasty! I finally got to play Legends of Frontierland this week, and it was a very fun experience. 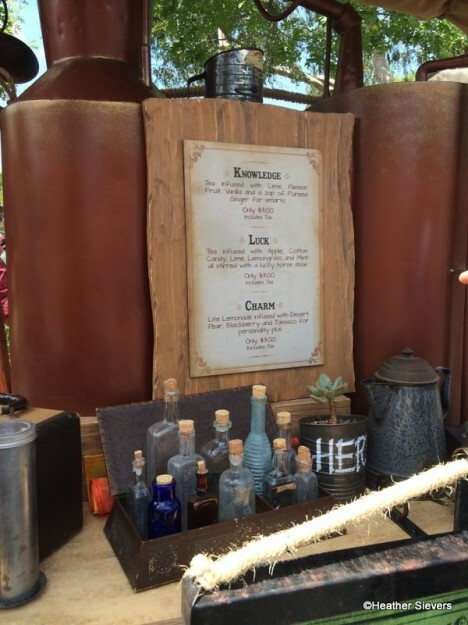 But these elixers might have been the best part of it! 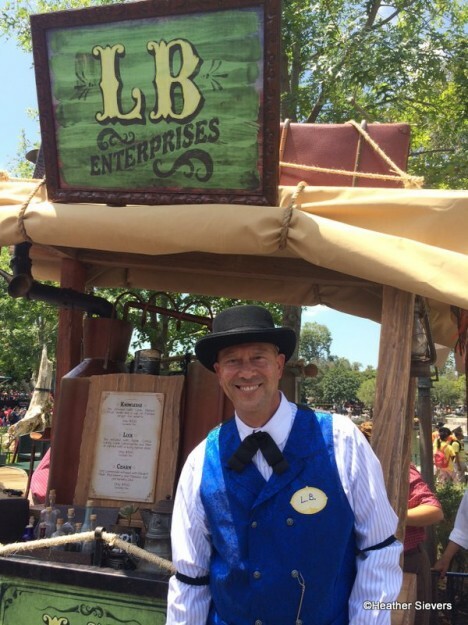 I really hope they consider making LB and his cart a permanent part of Frontierland even after it ends. I tried all three and liked them all–though I have to say my favorite was the one you didn’t like, the Charm! I never would have thought of putting hot sauce in lemonade (in any amount! ), but it provided just the right amount of zing. Though I don’t think the recipe said Tobasco anymore. I think it just said “hot sauce.” The size was perfect for these super refreshing beverages. You don’t need any more.